A media stream, such as a news broadcast, is supplemented with documents that are relevant to the media stream. The documents may be web pages returned from a search engine. 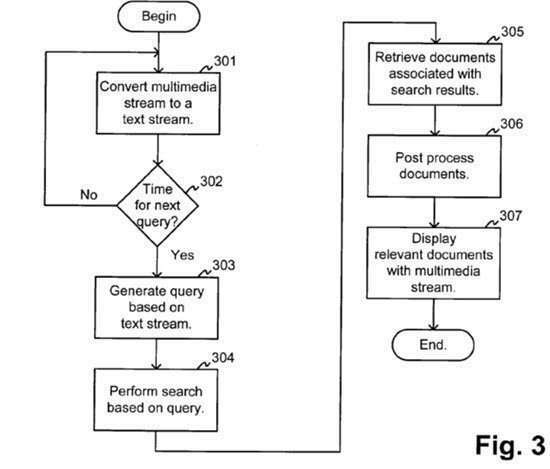 A search query generation component generates search queries for the search engine based on the media stream. A post processing component may re-rank and/or filter the documents to enhance the viewing experience for the user. Note that the patent is assigned to both Google and to Stanford University, which means that the patent may have been worked upon while Brin and Page were still students. The patent tells us of the creation of a transcript of the television show, and an analysis of the content of that show based upon algorithms that look at words that are less frequently used on the Web, which means that they are rarer words that aren’t commonly used on a large number of pages on the Web. The idea behind the patent is in creating a second screen experience much like many people experience watching TV while also using their smart phones or tablet computers to learn more about the shows they are watching. The paper from the 2003 WWW conference does a good job of explaining the algorithms that might used by a system like this. It took a long time for Google to be granted this patent, but it wouldn’t be surprising if Google used it somehow. – It seems like the idea of a second screen experience is more popular than ever.